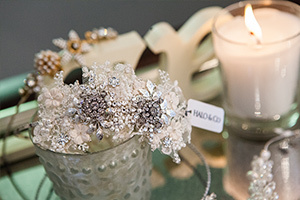 We are proud to stock a fabulous range of bridal accessories to complement our gown collection. This includes an extensive selection of headpieces, jewellery, shoes, veils, stoles, belts and sashes carefully sourced from the finest designers. Please contact us to make your exclusive accessory appointment and view the full collection. We are delighted to stock shoes from designer Charlotte Mills. Her loveheart shoe concept fits perfectly with our LOVE branding too, with each shoe style incorporating the theme in an individual and unique way. The Charlotte Mills shoe brand provides a fresh look to bridal footwear using a range of laser cutting, appliqué and embroidery, not to mention a refreshing splash of colour options in her collection. Each shoe is hand made in Spain and hand finished with a silver sixpence and the leather sole is embossed with a special message. Harriet Wilde is a British independent footwear label, established in 2008 by the designer Ruth Shaw. 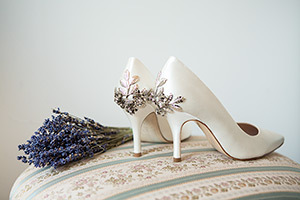 Her bridal footwear collection is unique and vintage inspired, stylishly designed in London and made to the highest quality by shoemakers in Europe. There’s a shoe in her collection to suit all of our dresses and she does a great range of heel heights too, including some beautiful lace ballet pumps with Swarovski crystals around the heel. Most of her shoes can also be dyed so they can be matched up to bridesmaid dresses or even for after the wedding. Donna Crain believes every wedding outfit should be unique, a work of art. Covering every style from vintage and Hollywood glamour to romantic floral pieces and sophisticated boho style, as well as off-the-shelf creations, Donna can dream up heavenly bespoke accessories with a particular bride's dress and personality in mind. Her work is intricate, graceful and feminine; lovely headbands with jewelled and feather clasps, luscious diamante hair combs, delicate tiaras, hair vines, circlets and fine decorated veils. Plus sumptuous earrings, bracelets and necklaces. Aimed at the discerning woman, Hermione Harbutt pieces are renowned for exceptional quality craftsmanship and originality of design. Her creations are stocked by prestigious and international designers and she has even been commissioned to create headdresses to complement their dresses. We have selected a stunning collection of jewellery and some more elaborate headpieces from her collection, all of which work beautifully with our gowns. If you are looking for something unique, wow and totally glamorous, then this is the accessory designer for you. 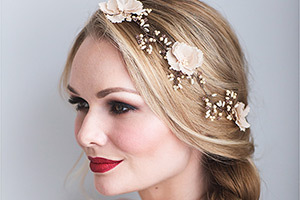 Halo & Co produce the finest quality bridal accessories, having a 20 year history in designing and producing ground-breaking, unique and stunning pieces for brides. 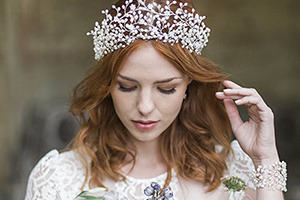 We have chosen a selection of headpieces from collections including their Timeless Classics and Vintage Lace ranges. Some pieces are just pure unadulterated sparkle, others incorporate Swarovski crystals, cultured pearls, ornate filigree and lace too. Our collection includes a mix of side headpiece styles, more traditional tiara styles and a selection of silver and gold pieces. Pompadour Couture Lingerie is a luxury British label creating handmade exquisite designs from only the finest silks, beautiful delicate laces and embellishments. 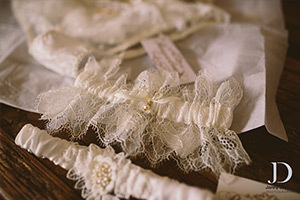 We stock a range of their limited edition and bespoke garters comprising unique one-of-a-kind pieces created from sourced vintage laces, Nottingham lace and antique adornments. So beautiful that you will want to treasure them long after your wedding day as heirloom pieces. A perfect gift from bridesmaids or even just to yourself. We also have an extensive selection of veils, stoles, belts and sashes carefully sourced from the finest designers. Please contact us to make your exclusive accessory appointment and view the full collection.